Spring Bud by Alvin Sterling Silver Trout Knife Set 6pc HHWS Custom Made 7 1/2"
Powered by Frooition.com Shop CategoriesHelpful LinksAdd to Favorite SellersSign up to NewsletterView FeedbackContact SellerVisit seller's eCRATER ShopAbout Seller Page SPRING BUD BY ALVIN STERLING SILVER TROUT KNIFE SET 6-PC HHWS CUSTOM MADE 7 1/2" Item DescriptionSPRING BUD BY ALVINSterling silverhollow handle with stainless implement TROUT KNIFE SET 6-PIECE CUSTOM MADE 7 1/2" in the patternSPRING BUDBY ALVIN.Itis NOT monogrammedand is in excellent condition.What is a “Custom Made” piece?Custom made pieces are made from an original piece in your pattern that are not otherwise available or difficult to find on the market, especially in discontinued patterns. 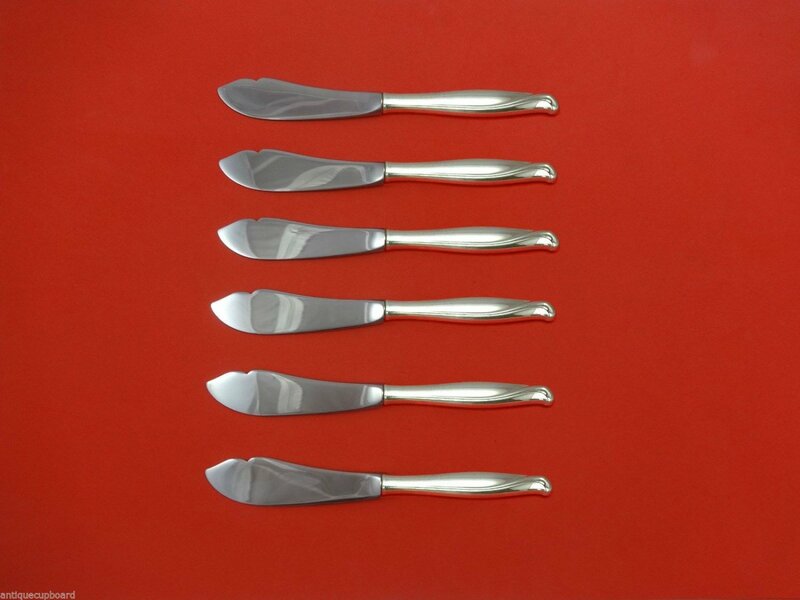 Hollow handle items are made from an original handle in your pattern with a new stainless or silverplated implement. Then the piece is hand-finished by a highly skilled silversmith in the USA. All custom orders are made-to-order and usually ship within 5-7 business days. Now that many sterling patterns have been discontinued, custom pieces have become a staple in the sterling silver industry and are widely offered by mainstream sterling flatware dealers.Why isn’t a Hollow Handle piece marked/stamped in any way? Is it sterling?Yes, the hollow handle is sterling and a genuine handle in your pattern, even though it is not usually stamped. Hollow handle items were usually not stamped due to their hollow construction. All of our hollow handle pieces are thoroughly inspected and tested prior to shipping and are guaranteed sterling.SATISFACTION GUARANTEED!TERMS & CONDITIONSWe will happily combine shipping charges on multiple items purchased. Please wait to pay for multiple purchases until combined into one invoice.Payment is due within 3 days of purchase.If you are not satisfied with any item you receive, we will gladly refund your payment in full (less shipping charges) for items returned within 14 days of delivery. Return shipping paid by buyer.If in a rare instance a stock discrepancy prevents us from filling your order, we will offer either a refund or a reasonable substitute for any pieces we cannot fulfill.International Buyers Please Note: Import duties, taxes, and charges are not included in the item price or shipping cost. These charges are the buyer's responsibility. Please check with your country's customs office to determine what these additional costs will be prior to looking or buying. About UsAbout UsPaymentShipping & Custom Terms ReturnsAbout UsFamily Owned & OperatedWe have been a family owned and operated sterling silver & fine jewelry business for over 50 years and we have been selling on eCRATER for over 10 years. Customer service is the foundation of all that we do. Our business is based on old fashioned values - honesty and integrity, and all of our items are backed by our 14 day money back guarantee. We sincerely appreciate the opportunity to earn your business.Personal ServiceA variety of services is just a moment away. Whether you desire assistance with a silver or jewelry purchase, choosing a gift for a loved one, identifying a pattern, or even selling your silver - we hope to be your trusted source.Enjoy your visit! PaymentPaymentPayment is due within 3 days of purchase. We accept payment by: Paypal and all major credit cards. Shipping & Custom Shipping & Custom SHIPPINGWe take great care packaging every item to ensure safe shipment to you. Shipping is free in the Continental US. Once your order has been processed and we have received cleared payment, your item will be dispatched as soon as possible. DOMESTIC SHIPPING:Domestic shipping is FREE on all items.Signature is required on all orders over $750 (per eCRATER policy).INTERNATIONAL ORDERS: It is our pleasure to work daily with clients around the globe. The shipping charges only cover the shipping cost from the United States to your country. Any additional import duties, customs fees, or taxes are not included in the item price or shipping cost. These charges are the customer's responsibility. Please check with your country's customs office, postal office or local shipping office to determine what these additional costs will be prior to purchasing. We ship via USPS PRIORITY INTERNATIONAL. If you prefer to use another alternate shipper, please contact us with details prior to looking. Customs: Each International order will be declared for the full value. CUSTOM MADE ITEMSCustom made pieces are made from an original piece in your pattern that are not otherwise available or difficult to find on the market, especially in discontinued patterns. Now that many sterling patterns have been discontinued, custom pieces have become a staple in the sterling silver industry and are widely offered by mainstream sterling flatware dealers. Custom orders are made-to-order and ship within 5-7 business days. Terms Terms TERMS & CONDITIONS We guarantee that the goods are as described in the above listing. We pride ourselves on our customer service. In the rare event that you have a problem with your item please contact us and we will be happy to help.International Buyers: Import duties, taxes, and charges are not included in the item price or shipping cost. These charges are the buyer's responsibility. Wisconsin 5.25% sales tax and Illinois 6.25% sales tax.Any item returned or unclaimed after our stated return policy will incur a 30% restocking fee. ReturnsReturnsWe offer a 14 day hassle-free return policy. Please contact us before leaving feedback and we will work with you to resolve any issues.How do I return my product?Returns or Exchanges must be returned within 14 Days of receipt. Please contact us through eCRATER messages or eCRATER's automated returns system. Enclose a copy of your receipt and and return details, and send to:Antique Cupboard, Attn Pam W232S7530 Big Bend Drive Big Bend WI 53103-9686 Powered by Frooition.comFrooition www.frooition.com | No-js Template | eCRATER design, eCRATER store design, eCRATER shop design, eCRATER template design, eCRATER listing design (ver:froo_no_js)This listing is currently undergoing maintenance, we apologise for any inconvenience caused. Kings by Wallace Sterling Silver Sugar Tong 4 1/2"
Bridal Flower by Watson Sterling Silver Grapefruit Spoon Fluted Custom 5 3/4"
Strasbourg by Gorham Sterling Silver Serving Spoon Pierced 9-Hole Custom 8 1/2"
George and Martha by Westmorland Sterling Silver Cold Meat Fork 8 1/4"
Prudence by Lunt Sterling Silver Fish Knife Individual HHWS Custom 8 1/4"
Acorn by Georg Jensen Sterling Silver Cherry Fork 3 5/8"
Renaissance by Durgin Sterling Silver Preserve Spoon Gold Washed Fluted 6 3/4"